Vehicles 2 is a new point and click physics game on notdoppler. 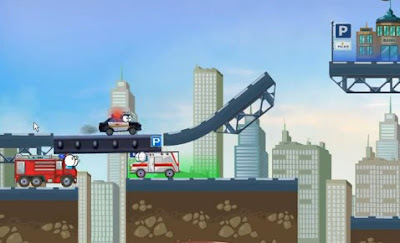 Your objective is to clear bad vehicles off each level then get to the corresponding destination. Take control of different vehicles from police cars to ambulance and fire truck. Each municipal vehicle has their own unique abilities that you can use to your advantage. It features 40 levels with progressing degree of difficulty. The physics aspect is great and the gameplay is quite addictive at the same time challenging. Meanwhile, here is Vehicles 2 walkthrough showing all levels completed.